This serpentine gatefold double album could easily have been a streamlined single, given that the two CDs together don’t even breach the 78-minute mark. But although that’s not the point when it comes to critical judgement of the contents it might be when considering space-saving on your already overcrowded shelves. Guitarist Jim Yanda’s trio lays out its wares with an eleven-track album only one track of which, the Weill-Gershwin My Ship, is a standard. I know it’s a critical commonplace these days that there are too many originals and too few standards in albums, but it’s a view to which I subscribe. This is an articulate group and it should be bringing nuances even to the most standard of standards. And in support of that contention it chooses to lead with My Ship, played with resonant and relaxed lyricism and moreover in a convincing trio fashion, not merely guitar-and-followers. There are bluesy riffs on In-Source where the leader is pushed hard and to advantage by the bass of Drew Gress and drummer Phil Haynes and a funky vibe saturates Country Mother along with some Country Blues echoes; good brief bass and drum solos round this one out. Sundog generates a fine rocking groove, athletic and foot-tapping with a take-off guitar solo. There’s a nebulous, sonically elusive start to Ghosthood before some twisting, coiling bass runs and bell-orientated percussion usher in some quite free playing and sitar-like articulation from the leader. Haynes – good name for a drummer – takes a long solo on Earth Way and there’s a laid-back NYC feel to Consecration, a more portentous title, perhaps, than is judicious – though it sports songful and bluesy elements and a defiantly blues-drenched sign-off. Daylude illustrates elements of the album that are both strengths – good choice of a mid-tempo, blues-infused – and weaknesses; an amorphous theme and distinctly unmemorable. 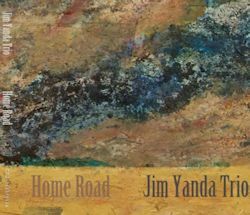 Home Road is a ballad, with well placed bass support and sparse but telling drums. This shows deft pointing. This isn’t a wholly successful twofer (which is really a onefer). Sometimes it meanders in search of genuine thematic distinction. Sometimes it just meanders. But at its best it shows a fine trio at work, though their avoidance of established classics in the end proves a decided limitation.